HMAS Canberra at sea during Exercise Talisman Saber 2017. HMAS Canberra uses a GE LM2500 gas turbine. Image via Commonwealth of Australia, Department of Defence. 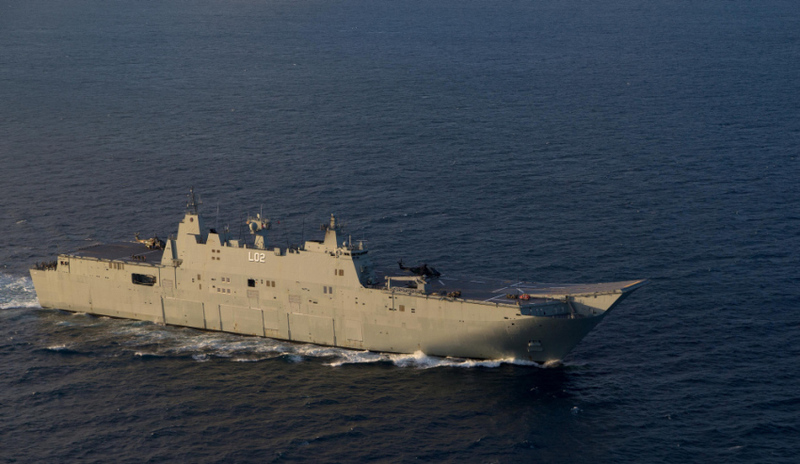 The Royal Australian Navy will be given greater insights into their fleet engine performance with a new, Australian-developed data analytics solution. GE and CSIRO’s Data61, Australia's data innovation network, have developed a data analytics solution to enhance the operational efficiency of the RAN. GE supplies the RAN with its LM2500 gas turbines that power the Anzac, Aelaide, Canberra and Hobart Class vessels. CSIRO’s Data61 has developed an application that will process data from GE engines captured from sensors and use advanced analytics to identify where improvements can be made. Data61 and GE said techniques such as machine learning and advanced algorithms will be used to predict future failures and reduce fuel burn. In addition, data visualisation tools will be used to represent the engine performance. The data analysis is expected to highlight areas where operational efficiencies can be achieved, such as improved reliability of performance, increased uptime due to enhanced understanding of component durability and functionality, reduced fuel consumption and lower maintenance costs. Data will be captured initially from two RAN vessels, which will then be used to help improve and manage the performance of GE marine gas turbines used more broadly across the fleet. Brien Bolsinger, vice president, GE Marine, said the project will enhance Australia's digital defence industry capability. "With the expertise of CSIRO’s Data61, we aim to use the insights gained from data to support the Royal Australian Navy," Bolsinger said. While this is the first Australian application of data collection from GE’s LM2500 engines for naval purposes, the company said there is enormous potential for further advanced data analytics tools to be developed here in Australia that can be applied to other GE-designed military and commercial marine engines. Adrian Turner, chief executive of Data61, added, "This partnership is a great example of how insights from data can be used to transform existing industries like defence, where cost savings from operational efficiencies can provide significant economic gains as well as serving the national benefit. "CSIRO’s Data61 and GE are both focused on the global opportunity to securely connect industrial equipment to the network globally. This project reinforces Data61’s and Australia’s strength in cyber physical systems, and in creating new value at the intersection of digital and domain, through the use of trusted data analytics." GE marine gas turbines are used by the RAN and 34 other navies worldwide, including the US, New Zealand, Japan and South Korea – providing a proven and established installation base. Globally, more than 1,450 GE gas turbines have logged more than 15 million hours on 600 naval ships. Data collection will commence at the end of 2017. The long-term aim of the project is to boost functionality and effectiveness of the current fleet, as well as optimise the design, production and support of future vessels.